I'm important and I make it a priority to take the time to shower every other day. However, the time lapsed from when I get undressed to when I actually get in the shower is far too long. Far tooooooo long. Some emergent thing inevitably rears his or her ugly head. I realize Julia hid my razor under her pillow, or razor bandit falls down half the stairs, or Sebastian wakes up from his little tiny morning napito in a fit of hungry rage. Always something. The shower itself is always short and inevitably punctuated by other emergencies on behalf of the needlets but, the other day they were quiet for far too long. Far toooooo long. Julia never popped her head in to do her usual check on how the knee shaving was going or tried to fill her sippy cup up with the hot shower water like she normally does. But I didn't complain. I dried off, got dressed, and went to check on the newly winged angels . 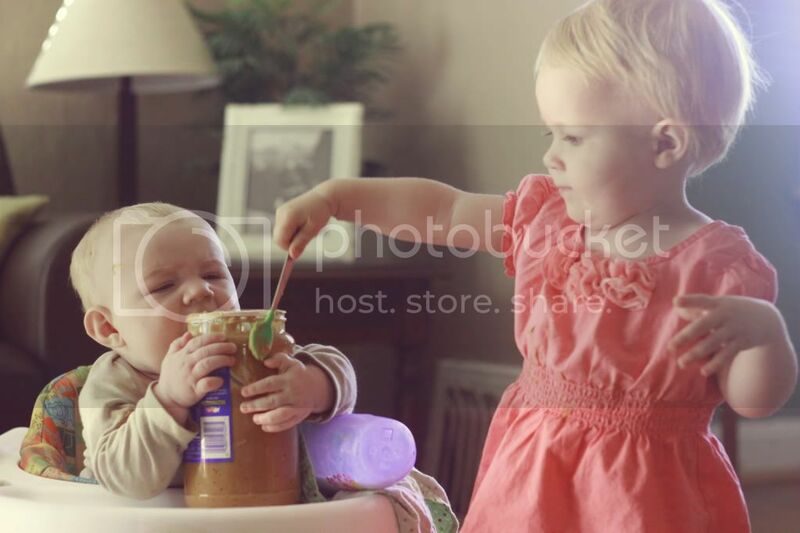 . .
Julia was merely ensuring (while still wearing her Easter dress) that Sebastian does not have a nut allergy and introducing him to a big bad food genre: the peanut butter vat. This scene (which was a lot of fun to clean out of Sebastian's thick hair and minimal neck folds) combined with the broken necklace beads I found stuffed in poor Sebastian's mouth after another luxurious date with Mr. Basic Hygiene makes me almost miss the days of showering with a captivated and immobile audience of a not yet walking Julia and a not yet eye opening Sebastian. *This is in no way a solicitation for advice on when to shower (after bed or before the children rise -- no thank you) it is merely an unsolicited peek into 6 unholy minutes of my glamorous life. As always, you're welcome. Not having any little angels myself, I always wonder how single and stay at home moms do their basic functions like shower and go to the bathroom. One of life's great mysteries. My favorite bathroom- evah!- had a glass shower and a garden tub right next to each other. I'd stick the kids in the tub -an empty tub, safety police!- and voila! instant containment system which I could observe while getting de-stanked. This house has no such fantastic setup. And I so often follow the trail of destruction with a sinking heart as I leave the bathroom. Matches, bleach, and looooooong ropes of Aquafresh are some of the highlights. Also, you should totally only shower after your children have been fed an organic, locally-sourced meal. Then given a bath with distilled water and pure glycerine soap. Then tucked in to ecologically responsible mattresses and sheets and read several culturally diverse stories featuring dynamic characters from all walks of life, socioeconomic status, religion, and race. Then sung to sleep via any of the lullabies from the Putanyamo World Lullaby collection. After those basic, necessary needs have been met, by all means, shower. naturally, this is after a day of playing with wooden, (or at the very least, recycled plastic) educational toys complete with field trips to farms, museums, and the like. and don't forget- the cribs have no toys, bumper pads, or blankets. My youngest is JUlia's age and my son just turned 4, as you know. I STILL spend my entire shower worrying about what they are doing out here. The day can turn on a dime and it's usually while mom is naked. Once they get old enough to be entertained/hypnotized by the glow of the tv...showering gets easier! For real, I just had a captive audience while I went to the bathroom. I almost cried. is this another step in the whole sibling bonding thing? hope you enjoyed your 6 mins of blissful uninterrupted showering/knee shaving. 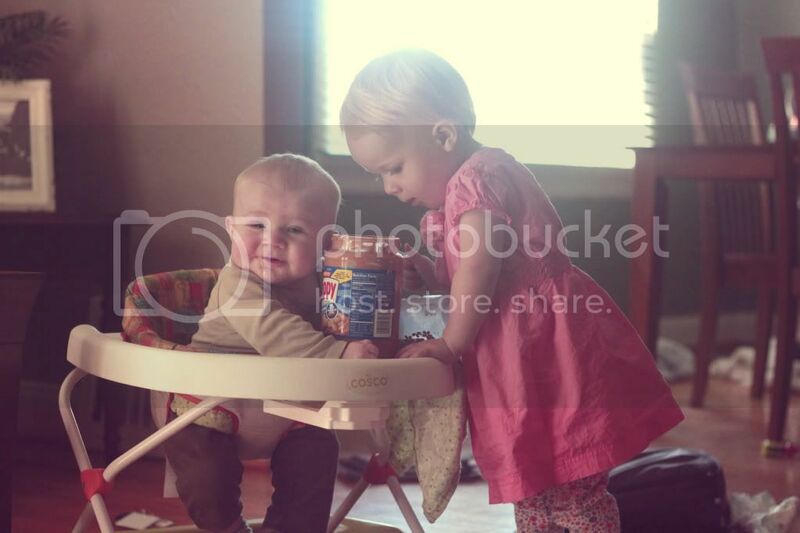 I love how Julia loves to share her favorite things in life with S! new favorite buzzword: napito. i'm going to try to introduce it into my vocab. Now we know what is causing Senastian's extra rolls. Secret eating. This is so funny. It almost put me into preterm labor. This takes me back sixish years, when my two oldest boys (sixteen months apart) were all I socialized with on a daily basis. I remember a particularly gruesome scene where my oldest poured a full bottle of chocolate syrup over his baby brother and it looked creepily like blood...and so much more. Reading your blog, I realize that, no matter how hard I think I have it now, the hardest stage is the one you're in! Now I have kids who can help and talk to me and life isn't so boring/chaotic/everything else! It's extremely chaotic, don't get me wrong...just not AS.